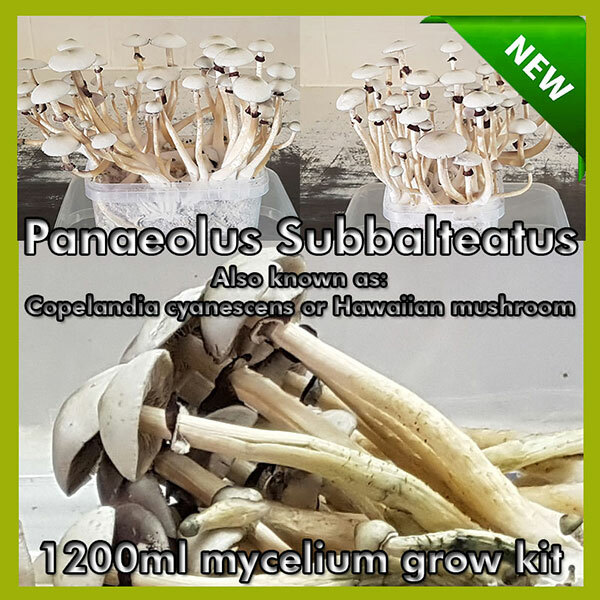 Were sure you've all heard about how potent Panaeolus cyanescens and Panaeolus tropicalis are. According to scientific reports published by P. Stamets and others, they are reported as the 4th most potent mushrooms God has put on this planet we call earth. Panaeolus cyanescens grows scattered to gregariously in dung and fertilised pastures and fields. Widespread in most semitropical zones and occasionally seen in the Mediterranean region. We have grown this species on a mixture of straw and dung with a thin casing layer. It is very important that the casing layer is not too thick as this species seems to have difficulty growing through it. A thin casing layer owever seems necessary for fruiting. This species is a very strong producer of psilocybin/psilocyn and mushrooms show a very strong blueing reaction when bruised. Well, straight up, they are very potent and deliver an extremely beautiful vibe beyond description. So peacefull and colorfull, very potent yet about the "smoothest" mushroom experience out there in my opinion. Its hard to put it into words, you just have to experience them, and you will know. Pure bliss!